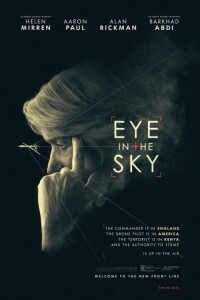 In the movie Eye In The Sky, which was released in secrecy by the new movie studio BST, stars Helen Mirren as Colonel Katherine Powell, a UK-based military officer in command of a top secret drone operation to capture terrorists in Kenya. Through remote surveillance and on-the-ground intel, Powell discovers the targets are planning a suicide bombing and the mission escalates from “capture” to “kill.” But as American pilot Steve Watts (Aaron Paul) is about to engage, a nine-year old girl enters the kill zone triggering an international dispute, reaching the highest levels of US and British government, over the moral, political, and personal implications of modern warfare. Oscar winner Helen Mirren and the late Alan Rickman star in Eye In The Sky. The horrible actor, Barkhad Abdi, who was pulled off the street and cast in Captain Phillips, only to receive a token Best Supporting Best Actor Oscar nomination from all of the liberal Hollywood Oscar voters, has mysteriously reappeared on screen. He also has 4 movies in production, which shows how low the liberals will stoop. Find an African who can’t speak English, who is uglier than sin, can’t act, yet cast him in movie upon movie, just to pat themselves on the shoulder. When motocross and heavy metal obsessed thirteen-year-old Jacob's increasing delinquent behavior forces CPS to place his little brother. .